“SUNSET JAM”, said the poster at my local 7/11. An event would be held at an imitation German castle that an insane development company had built in the woods in the middle of nowhere, in a location barely accessible by bike over several hills of unkempt road. There was a place and time on the poster, but no description. What kind of music? Who would be performing? Only the enigmatic letters RGP, surrounded by illegible English, distinguished the event on an otherwise completely unmarked poster. Well, whoever it was was promising “FREE FOOD FREE DRINK” (actual meaning: all you can eat, all you can drink). I was also intrigued by the fact that there was only one poster for this, as far as I could tell, in the entire town. Were they trying to keep people away? Anyway. That evening, there was another event in the city, but it started after 10pm and was quite far. I figured that, worst case scenario, I could duck out of SUNSET JAM, power bike through the wilderness back to town, and hop on the last train. The only unacceptable option was staying home on a Friday night. I did not know what I was getting myself into. The first hour and a half of the concert was fairly boring. There was a tent, a horrible DJ pressing the “scratch” button on a synthesizer way too many times, some staff hovering around, drinks, and food. I was all by my lonesome for some 20 minutes, and wondered whether the event would be canceled. As time went on, some couples and families shuffled in, all of them wearing ridiculous faux-American T-shirts, one with dyed blond hair, and all seeming to know each other. The DJ kept telling us to eat and drink. I felt oddly like he was fattening us up to feed to his unearthly children. Then the belly dancing began. Completely out of nowhere, the music stopped and some half-naked women went up on the stage and started dancing around. Wait, what kind of event was this? Why didn’t they advertise this on their poster? My cynicism dropped away and as I drank my free beer I was plunged into a universe of the surreal. The belly dancers hopped off the stage and mingled with the audience. One of them was extremely good. I did not know that rural Japan had so many belly dancers. Then they were replaced, just as suddenly, with a African drum team in Mexican dress. A simple but undoubtedly un-Japanese beat rose out of the tent, causing drunk people to spontaneously rise from their seats and move to the dance floor. Men waving bottles of a clear, fizzy drink I had never seen before gathered under the stage, occasionally grabbing the drum from their buddy on the stage and hitting it a couple times. When I started dancing the men slammed into me, grabbing my shoulder to dance together, hitting me on the back, inviting me to hit back and basically creating some sort of mock battle under the stage. I was strongly encouraged to grab one of their fizzy drinks and chug the whole thing. At some point I did. 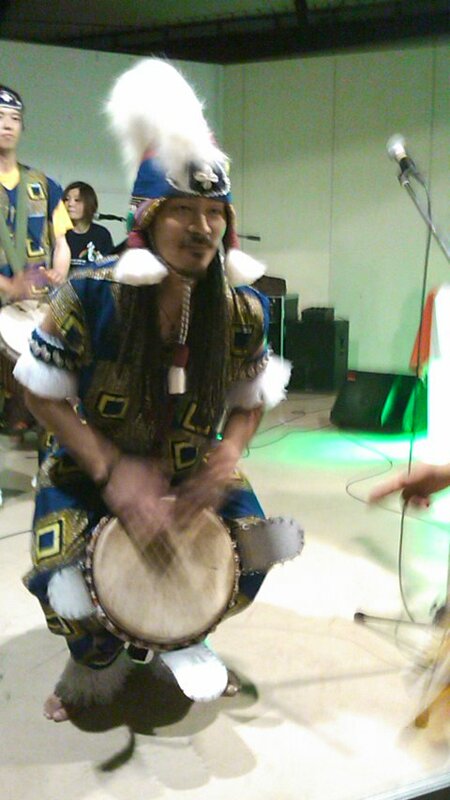 The drumming went on and on, building to a crescendo and collapsing again. I’m not sure how long this part of the “concert” lasted. I missed the last train, obviously, and was taken back to my apartment by some partygoers. My bike is still up there in the mountains. I am unsure whether I accidentally ate dinner with a countryside pagan cult. 97% of my village in Japan uses an ordinary cable provider with access to dozens of channels. My apartment complex does not. Instead, I am hooked up to something called a テレビ共同受信施設組合 terebi kyoudou jushin shisetsu kumiai, or “Cooperative Television Reception Facility Union”. Basically, I live in a valley that gets no TV. Some group, unknown to me except for the message I just received from their president, strung some wire up to the top of a mountain and put an antenna up there, which was connected to households around the are to create a Cooperative Television Reception Facility. This is, I guess, a lot cheaper than using the cable provider. These things are apparently common both in urban and rural Japan. But they are only as good as their reception, and I just got a letter in my mailbox informing me that one of the channels broadcasting from over the bay can no longer be reached, and they have replaced it with another one. I get a total of 8 TV channels this way, two of which often broadcast the same content. There is no option to buy more. This is the situation for many people in Japan, which is why the policies of the big channels, for example Fuji TV’s pro-Korean bias, are very important.